Cosjet SR is innovative & powerful device. 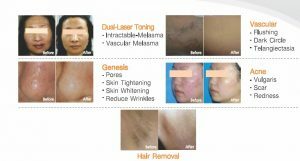 It works effectively in skin rejuvenation with genesis mode, in hair removal with strong and stable energy output. It removes hair in 4 sittings. The smart handpiece changes & treats spot size varies from 2-10 mm with faster and optimal penetration.